What say the public homebuilders? Part 2. What say the public homebuilders? Part 1. Today and yesterday JP Morgan hosted a Homebuilding and Building Products Conference in Las Vegas which featured presentations by the various public homebuilders on the state of the market for them, how they're adjusting and their respective plans moving forward. Claim: Housing Bubbles GOOD for the Economy? At last month's ULI (Urban Land Institute) Fall Meeting, Newsweek & Slate columnist Daniel Gross gave a keynote address entitled -- improbably enough -- "Pop! Why Bubbles are Good for the Economy." "The upside comes with the way Americans deal with these issues. When you look back through history, after the bust comes, the consolidators come in and create a system that works efficiently. The other positive thing is that the infrastructure built during the bubble stays up. New ownership comes in with a lower cost basis. And, the mental infrastructure remains. During bubbles, promotion companies spend a lot of money on hype and marketing, trying to get consumers to adapt to new ways of doing business. The mental infrastructure – which gives people with new mindset of how to do business – remains (after the bubbles pop). And the combination of these two infrastructures creates a new platform for businesses, and we have new industries not even imagined during the bubble." So is he just plugging his new book, or is he on to something? According to his ULI address, the U.S. is a different place today due to three main trends: (1) Going 'luxe' (i.e., the top 1% of U.S. households control 20% of the wealth and so are less sensitive to credit tightening; (2) Going global (U.S. GDP is now 27% of worldwide GDP, down from 31% in 200); and (3) Going green (i.e., energy-efficient products, alternative energies, new homes with their own solar and other energy plants sending power back to the grid, etc.). The 3Q 2007 numbers from the National Association of Realtors shows a 2% decline in the median price for a single-family home sold during the 3rd quarter of 2007 from the same time last year. But where is the most damage? Certainly Sacramento (-10.50%) and Riverside/San Berdo (-7.60%), whereas there were INCREASES in the SF-Oakland-Fremont (+8.60%) and the Silicon Valley areas (+9.40%). 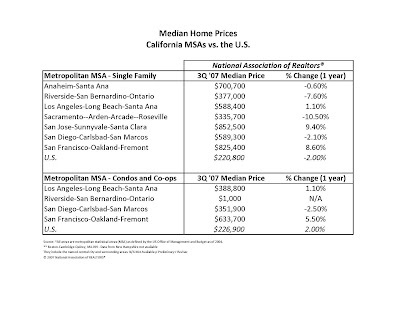 For condos and co-ops, median prices actually went up by 2% nationally: for California they rose by 1.10% in L.A. County and 5.50% in SF-Oakland-Fremont but fell by 2.50% in San Diego County. So does this mean prices for an individual home are holding steady or are the figures simply a reflection of where the sales activity lies (the median is the midpoint for all sales)? Probably the latter, as the S&P/Case-Shiller index (which tracks sales of the same single-family homes) fell by 4.5% nationally during the same time period (and -7% in L.A. alone). At the recent BIS trade show in Long Beach, the (unfunny) joke was complimenting those people working for builders, lenders and suppliers who still had jobs. Not surprisingly, now it seems that the California economy -- as during the recession of the early 1990s -- is in greater peril that that of the overall U.S., as discussed in The Economist and quoting economists Jack Kyser and John Husing. According to the article, "In the past year California's unemployment rate—a simple measure of economic health—has jumped from 4.8% to 5.6% (see chart). The national rate has risen, too, but not nearly so steeply. And that mild increase has been largely driven by just one state. Out of every three additions to the ranks of the unemployed in the past year, one was Californian." According to Inland Empire expert John Husing in the article, "...some official statistics are too upbeat. In California, about one worker in 11 is illegal, and thus unable to claim unemployment benefit. In some of the industries that have suffered the greatest job losses, the proportion is considerably higher." One key problem with offering incentives and price cuts to buyers of new homes is that they're likely to assume that if they wait there will be even better prices down the road (similar to my own reasoning for waiting to buy a 52" LCD TV until after Christmas). As discussed in The Wall Street Journal, when EVERYONE offers incentives or price cuts they're no longer special. It's a lot like dating -- people always want what they can't have, and don't appreciate what's offered too easily to them. So what to do, play the field and postpone a commitment or jump now? If you wait too long, you might risk your favorite future home becoming a rental, as is apparently happening to some high-profile condo projects in downtown Los Angeles and North Hollywood. During the last housing recession of the early 1990s (and I worked in this industry through all of that and tracked incentives and price changes closely) builders took much longer to enact price cuts and incentives were more of a novelty, so even though buyers shopped incentives more than homes or neighborhoods (which I always thought was a stupid thing to do), the slower pace and shallower price cuts left buyers with more confidence that values would not fall any further. This time -- and in an effort to 'find the bottom' faster than the market might do otherwise -- builders offered incentives much more quickly and enacted price cuts as soon as their competitors had matched common incentives such as discounted or free upgrades, financial assistance and non-recurring closing costs. But that was only Round 1, which involved builders cutting into fat (i.e., profit margins). Round 2 -- in which we are currently involved -- involves builders cutting into muscle (hence the numerous job layoffs) by offering a scope of incentives and price cuts designed to move inventory on the practical theory that bringing in any cash is better than no cash at all. For most builders it's now all about servicing debt loads, whether it's in the form or land or bonds. At some point a builder (such as Lennar, which has decided instead to postpone developing some projects) or a builder's lenders, partners and investors will no longer approve any more price cuts, because if they can't service their debt then the entire reasoning for the price cuts is gone. Hey, why sell now if the loan's already going into default? Might as well wait to renegotiate the terms, maybe mothball the project or rent it out and come back another day. If a bank is forced to take over existing projects due to a loan default or a bankruptcy, their price cuts could be much less than what the builders would offer because their time horizon is different, plus what happens to customer service if a bank is forced to sell off a bankrupt builder's assets? It's much better to deal fairly with a builder who will be there well after the sale and not be so short-sighted to demand price cuts that imperil a company. Few things are more important after buying a new home than customer service; who would you rather call when you want to claim a warranty item -- the homebuilder or an 800 number at B of A? "The housing downturn has entered a second, more dangerous, phase: one in which the construction rout deepens, price declines accelerate and the wealth effect of falling prices begins to change consumers' behaviour. The pain will be intensified by a sharp credit crunch, the scale of which is only just becoming clear. And, in the short term, it will be exacerbated by a spike in oil prices—up by 25% since August—that is extreme, even by the standards of recent years. The result is likely to be America's first consumer-led downturn in close to two decades." One of my primary complaints about the media -- which is likely a result of editorial cuts in various newsrooms -- concerns those journalists who blindly report statistics without defining (or questioning) the underlying methodology. For example, only now are reporters even regularly questioning the methodology of RealtyTrac versus another source like Dataquick. It makes me wonder how many past headlines would've been printed in a smaller font had the sources been vetted better. Take today's release from The Commerce Department; hey, it looks like starts are up by 3%! A rebound? Sure, for multi-family homes, which rose by 44% (after the previous month's 36% plunge), not so fast for single-family home starts, which fell by over 7%. Of course we can expect revisions down the road, because the sample only includes about 900 permit-issuing jurisdictions out of a universe of 19,000 permit-issuing places -- or a sample size of less than 5% (anyone similarly fascinated with how they do this can find the methodologies here) -- these national numbers can swing wildly in successive months, especially when you realize that their field surveyors estimate total starts for buildings of 1-4 units at a 1/50 ratio and then count total units for buildings with 5 units or more. Clear as mud? Great! And the results of this monthly tally are quoted and published nationwide -- generally verbatim -- each and every month. I'm not saying don't use the numbers at all - I'm just saying that any such quotations should note that they're (a) seasonally adjusted (and how that could impact the numbers); and (b) based on a relatively small sample size that requires a lot of guesswork. While they're claiming a 90% confidence level (which in statistics measures how right you think you might be based on the sample size), the constant revisions down the road would suggest otherwise to me. Call me a cynic! A better indicator from Commerce might be building permits, because the sample size (8,500 permit-issuing places) is simply much higher -- well over 40%! In this case, U.S. applications for building permits are down by 6.6% for October and by over 24% from the same time last year. In the West, total permits for October were up by 4.5% from September but down by 2.6% for single-family homes. Since October of 2006, total permits in the West are down by 18% for all units and by 30.9% for single-family only. If you'd like to see how individual markets of California are faring (at least for September, October numbers should be posted any day now), the CBIA compiles these numbers monthly with the help of the Construction Industry Research Board, which personally contacts each city/county statewide (more on how their data differs from the Commerce Department's in another post). Fannie and Freddie getting shakier? A recent story in Fortune magazine rattled some cages over the weekend, as analysts are now questioning a new methodology that FannieMae uses to summarize bad loans on its books; had it continued with its old system, the loss ratio would now be beyond the 0.4% to 0.6% range (or 4 to 6 basis points) that's typical for the home loan giant. According to Fortune writer Peter Eavis, "Management acknowledges that credit losses are mounting. During an analyst call last week, Fannie Mae CEO Daniel Mudd warned that the company's loss ratio could rise to eight to 10 basis points in 2008, due to a worsening housing market. It's not clear whether that forecast is based on the old or new methodology. The company may already be exceeding that 2008 guidance. Based on the old methodology for calculating the loss ratio for the third-quarter alone, the company's annualized loss ratio is already at 14 basis points. If so, Fannie Mae's mounting losses are disturbing. So what could a soaring loss ratio mean for Fannie Mae? Consider these numbers: At Sept. 30, Fannie Mae had exposure to $74 billion of loans with a FICO credit score below 620. Loans scored below 620 are generally classified as subprime. In addition, Fannie Mae has exposure to $196 billion of Alt-A mortgages, home loans for which the borrower doesn't have to submit complete documentation for basic criteria like income. At the same time, Fannie Mae has only $40 billion of capital." A few days later, little brother FreddicMac announces its own $2 billion loss and seeks new cash infusions, which is even more troubling since that loss was much larger than the much larger FannieMae's $1.4 deficit at the end of its recent quarter. Is it possible that FannieMae's deficit is actually far greater than the $1.4 billion it reported? Underscoring that mindset was a 6.2% decline in Countrywide stock, which has been heavily dependent upon the two GSE (Government Sponsored Entity) groups to buy its loans. As the Federal Reserve directs its crystal ball towards 2010, its notes from last month's meeting indicate that it's trying to balance the threat of rising inflation against the severe housing downturn while maintaining that the last rate cut was a "no brainer." Hey, is that like those "no brainer" ads that Lenox Financial runs on the radio, in which a stern voice offers to help convert adjustable-rate loans (which they used to peddle) to the fixed-rate variety? And just in time for the holidays! According to a story in today's Wall Street Journal, "Participants generally viewed financial markets as still fragile and were concerned that an adverse shock -- such as a sharp deterioration in credit quality or disclosure of unusually large and unanticipated losses -- could further dent investor confidence and significantly increase the downside risks to the economy," the FOMC said. Other near-term (?) risks including the falling dollar (which is really more of a longer-term story but helps U.S. exports), rising energy costs (esp. for oil) and high unit labor costs. The FOMC is considerably more relaxed about the economy’s medium-term health than are markets and an increasing number of analysts. While admitting that downside risks to growth are greater than upside risks, FOMC members believe that sub-par growth is not likely to persist and that growth will pick up as housing bottoms, financial markets resume a more normal level of function, and the lagged effect of earlier policy easing is felt. These minutes underscore the disconnect between financial markets which are discounting another [percentage point] or so of Fed easing over the coming few quarters and policymakers who thought the last [quarter point] easing move was a “close call” and who don’t seem particularly eager to ease any further in the near term. –Joshua Shapiro, MFR, inc.
"Indicators of market distress continue to move in different directions. Foreclosure activity is at record levels, financing with adjustable-rate mortgages and with multiple mortgages have dropped sharply. Down payment sizes and flipping rates are stable, non-owner occupied buying activity is edging up, DataQuick reported. " But since the table is general, if you want to know how your zip code is faring (at least through September), you can find it here. "Judge Christopher A. Boyko of Federal District Court in Cleveland dismissed 14 foreclosure cases brought on behalf of mortgage investors, ruling that they had failed to prove that they owned the properties they were trying to seize." "Lawyers for troubled homeowners are expected to seize upon the district judge’s opinion as a way to impede foreclosures across the country or force investors to settle with homeowners. And it may encourage judges in other courts to demand more documentation of ownership from lenders trying to foreclose." If this defense becomes more mainstream, what does it mean for foreclosures and property values? To share the reality of where the development industry (primarily housing, but also sometimes retail, office, industrial and other land uses) is headed, whether bad, really bad, about the same, slightly improving or finally showing some real life. Having started in this industry in the late 1980s, I've already been through the boom-and-bust cycle of the 1990s, which at the time was described as "the worst housing downturn since the Depression," so I'm a bit leery of any hyperbole from either the media or other bloggers. At a time when other housing blogs have selected names such as "housingpanic," "housingdoom" and "drhousingbubble," I thought it was time to introduce some semblance of neutrality to the discussion of the housing market, hence the rather pedestrian (and neutral) name "Housing Chronicles." On our recently launched website (www.metrointel.com) we've included a variety of links and news feeds from national and local sources (at least local to California) and various real estate-related blogs, with the idea being that anyone visiting these pages can quickly review the top economic and real estate headlines of the day, click on those which interest you further to print out or read later, and then get on with your day (and given the layoffs everywhere I'm sure your days are busier than ever). To make it even easier for you, we'll be reviewing these same links and news feeds and discussing what we think they mean for the real estate and building industry in this blog (hopefully several times per week), so even if you simply read it regularly we're hoping you'll feel like you're up to date on the most important issues of the day. But we also need INPUT from readers. When I helped create and launch The New Home Report (which summarized monthly traffic, sales and inventory trends for each county in Southern California) back in 1993-94, we changed its design and content FIVE times in six months because we wanted to create a compelling and useful product for the building industry. Armed with that same philosophy for this blog and for MetroIntelligence (www.metrointel.com), we hope to create a site that you'll find saves you time and makes your day a bit easier. We're going to be adding more content and more links so that you'll be able to get any information you need with the simple click of a link -- sometimes it will be free, other times it will cost you a bit -- but given the enormity of data now available on the Internet, we hope that you'll make our little roadmap your starting home page each day. In fact, why don't you just do that now? And if you want to check out the blog, it's also available on that site at www.metrointel.com/ourblog. Hope to see you at BIS!